Welcome To Dallas-Ft. Worth’s Premier 36 Hole Daily Fee Facility! The CREEK and LAKES courses provide 36-holes of Championship golf at Indian Creek Golf Club in Carrollton, TX. With 3 sets of tees and 7000+ yards each of the layouts are diverse and offer players of all skill levels the option for recreational play or pure challenge. The LAKES boasts tree-lined fairways with native Mesquites dominating the ecosystem and the course is accented by tranquil lakes making it a sanctuary for bird-life and golfers alike. A strategic approach here starts with proper club selection off the tee. The CREEK is well known across the Metroplex for it’s rolling terrain, generous fairways and large greens. The course winds through trees and creeks and at times follows the Trinity River, it inspires and challenges golfers all at the same time. A signature hole is difficult to single out, but Hole 12 is a top contender, the picturesque Par 3 plays 260 yards from the back tee. Updated GPS is on board all golf cars along with USB ports for charging needs. 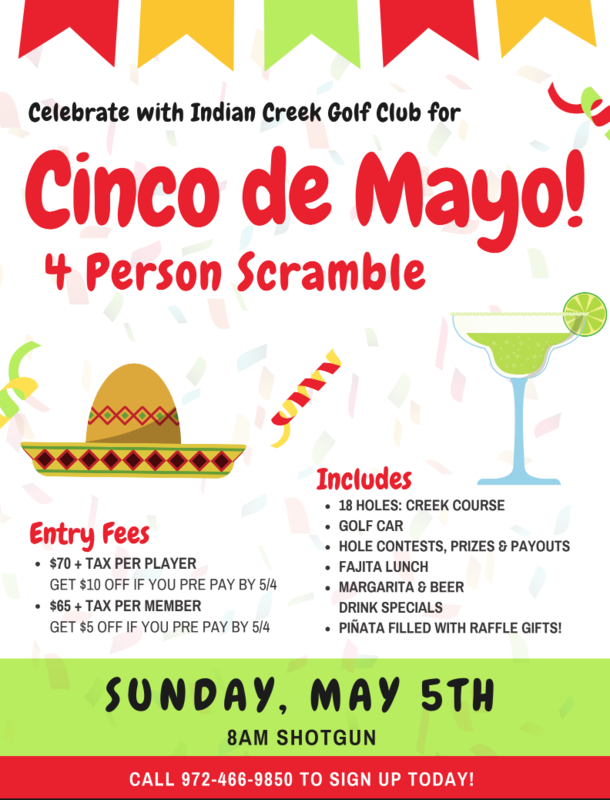 On-course beverage service and full amenities complete the exceptional golf experience at Indian Creek Golf Club. The Trinity Pass provides access to both courses on an Annual basis, it’s a great value for the avid golfer. Check out all the 2017 Annual Passes, they are designed to enhance a golf lifestyle at an affordable price.